Over the last decade I have released five studio albums of completely new material: Vozero, 6pm, 50 mins later, Firebird V11 and Corroncho. During this same period I also released a retrospective compilation of two cds and a DVD called ‘ Phil Manzanera,1972-2007, The music’. In the last few years, in between touring and producing, I have enjoyed revisiting my solo albums and re-releasing them as series of Collector’s editions, raiding the archive for lost tracks and memorabilia. The latest Collectors’ editions are my first solo album Diamond Head and Quiet Sun’s Mainstream , albums from 1975. I think of them as fraternal twins, recorded at the same time, gestated in the same studio and over the same time period: 12pm-6pm Diamond Head sessions and Mainstream, the Quiet Sun album from 6pm-12am. Quiet Sun was the band I was in before Roxy Music, with Bill MacCormick , Charles Hayward and Dave Jarrett. Because of Roxy’s success I had the opportunity to record a solo album but unbeknownst to my management company I recorded two albums in the studio time allocated for one album. When they were finished I presented both to a stupefied management and Island Records. These two new Collectors Editions bring together all the recordings from the sessions, with demos and versions as well as new photos and is intended not only for the collector but also as an introduction to the variety of music that has interested me over the last 40 years. 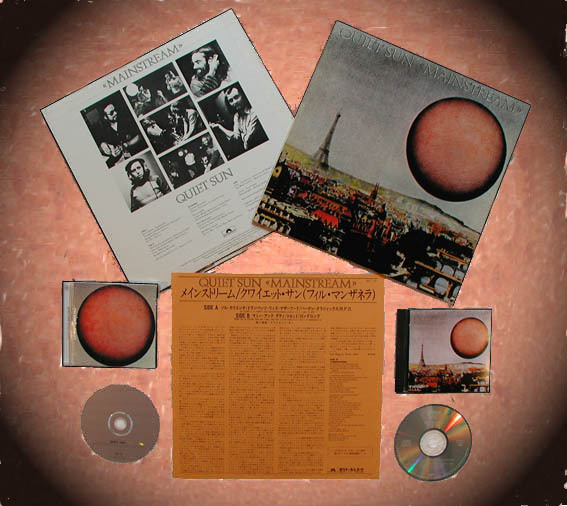 Mainstream was recorded unknown to the record company in January 1975 during the same sessions which produced Manzanera's "Diamond Head" album in 1975, Quiet Sun's album is a stark counterpart to that release. Where "Diamond Head" applies a rock context to experimentalism, "Mainstream" displays an unrestrained explosion of progressive tendencies. "Mainstream" is 39 minutes of prog rock laced with attack guitar and a distinctly felt enhancing tweak to nearly every sound heard. In this music, no individual instrument dominates for very long, the structures are constantly flowing from one instrument to another. From a guitar snarl to a twinkling organ to a monstrously growling fuzz bass to intricate percussion to more guitar snarl to moody electric piano. . . .
Compositionally, this music is deliciously complex and esoteric despite the powerfully appealing riffs. Confounding its intellectual nature, this music radiates a strong sense of cheery playfulness. Yet, this secret sonic smirk is delivered in tandem with some incredibly intense moments . . . the beginning of "Mummy Was an Asteroid, Daddy Was a Small Non-Stick Kitchen Utensil" stands as one of the most pulse-quickening start-ups in modern music. Charles Hayward Drums , Percussion, keyboards, Voice.